With DSLRs like the Canon T2I and Nikon D3200 becoming increasing accessible, and smartphone cameras becoming increasingly quality, fixed-lens point-and-shoot cameras have become something a forgotten breed. 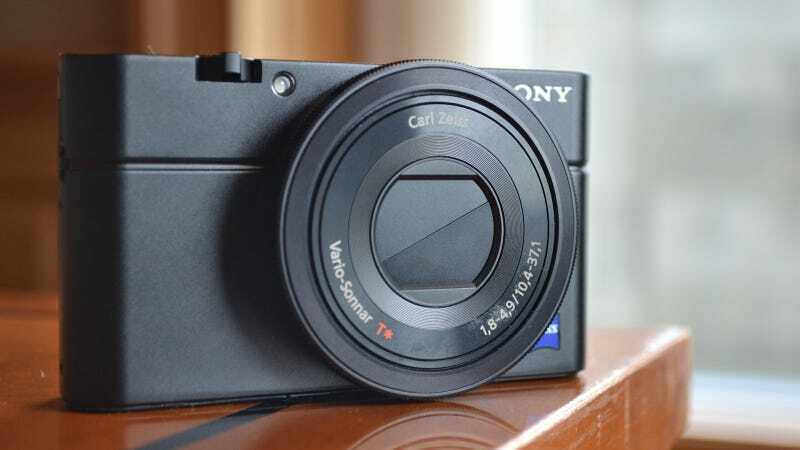 But with the introduction of the RX100—complete with its impressive 1-inch sensor, f/1.8 aperture, and compact body—Sony is trying to make the pocketable camera relevant again. When it comes to specs, the RX100 is nothing short of impressive. The sensor is a 20.2-megapixel beast that's part of Sony's Exmor family and powered by the Bionz processor. The glass is a 28-100mm Vario-Sonnar Zeiss lens with 3.6x optical zoom and that impressive, aforementioned f/1.8 aperture. The camera has an ISO range of 100-25600, with an auto ISO limit of 6400. Video is an AVCHD affair, with 1080p recording at 60 frames (there's also a 720p MP4 mode). The all-aluminum body isn't much bigger than the Canon S100, and comes equipped not only with fully-programmable manual controls on the back, but also around the lens. The all-black camera is nothing short of beautiful, with stripped down, no-nonsense design that invokes the lines of a Leica camera. Because Sony packed such a large sensor, and went with a fixed lens, it was able to open up the aperture to let in plenty of light. This not only means sharp images, but also powerful defocusing effects (a.k.a. those nice background blurs). The 1-inch sensor is bigger than those found in both the Canon S100 and G12, not to mention the Fuji X10 and Panasonic LX5. And despite the technical wizardry, the battery is rated for 330 shots-per-charge on average. In the brief time I got to play with the thing, the RX100 impressed. In both the automatic and program modes, shots were sharp and detailed, even without optimal lighting. At times, the shots certainly looked comparable to those produced by considerably more powerful cameras. Though the is small and light, it hardly feels insubstantial, and can be operated without having to contort your hand in weird ways. And the big 3-inch screen is nice and bright, thanks to the LCD's added white light which is designed to combat sunlight.